Figliola and Romano has always been committed to providing strategic and efficient representation to the local businesses of Rhode Island. 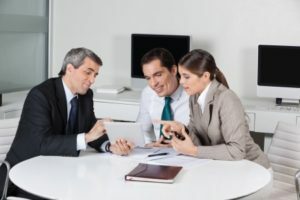 We offer a broad range of counseling from helping individuals choose the proper business entity to drafting and enforcing operating agreements in court. Choosing the proper business entity and drafting solid operating agreements are essential when starting a business. Our firm can assist you in creating the appropriate business entity that best suits your needs and helps you form the foundation of your business. Several factors should be considered when determining which legal entity best suits your needs. Among them are liability protection, qualifications, tax consequences, formation issues, and the ability to raise capital. Our firm will work with you to set up the best legal entity that suits your needs and vision for business. Starting a new business can be both exciting and overwhelming. It is important to have a strong foundation set in place in the event something goes wrong, especially if there are several individuals involved. Our attorneys can help you form an operating agreement which sets forth the rules of management, percentage of ownership, rights and responsibilities of the individuals in the business, rules regarding selling and transferring ownership shares, and allocation of profit and losses. Without a strong operating agreement in place, the business will be governed by the default rules set forth under the laws of Rhode Island. This can have unintended consequences for situations you never originally considered. Let our seasoned attorneys develop a comprehensive plan tailored to the specific needs and vision of your business. We are experienced trial lawyers willing to litigate your case if necessary. Let us take care of your dispute while you take care of business. To schedule a free consultation with one of our lawyers, please contact our law firm online, or call us today at 401-289-0404.